Of course NFL Coaches are scared of what their Players will do if they are not not happy. Of course NFL Sponsors are busy wrapping themselves in the American Flag. Each sponsor has it’s own reasons why they stand out from the crowd, both supporting American Soldiers and America’s right to protest. Kind of covers all the bases for NFL Sponsors? How nice. Entertainment, getting away from pressures of life, relax and support their home team. Do Fans really want politics played out on the field before them? Players in the NFL are paid to play. They have several other means available to make a difference, including, “putting their money where their knee is”, to protest and draw media attention to their cause. 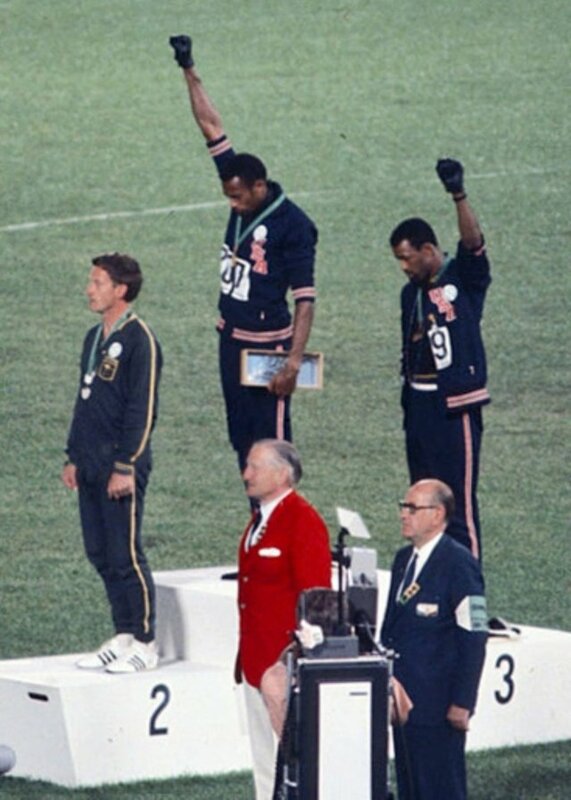 NFL Players are not the practically penniless Olympians on the podium in 1968, who were forced to share a pair of gloves in a, “Black Power Salute“, because that is all they had. Those guys were not only putting their Olympic appearance on the line, they put their future on the line, and paid a hefty price in the doing. As I presume you know about working for a living, do you know what your right to free speech is in your workplace? In case you are not aware, your freedom of speech is very limited at work. If you live in the United States, your employer has the right to loosely determine what type of speech is allowed and what type of speech is banned. We can only imagine then, that in the NFL, and specifically at the Team level, this type of “speech” is not only allowed, but encouraged(? ), out of subtle fear of players – who may or may not realize they hold power over their Coaches and Team Owners? Who are the losers in this controversy taking place? Fans mostly. Everyone else who doesn’t follow football, or sports in general are a close second. It is time to remember that serious change takes place slowly, and mainly takes place when one generation dies off and a younger generation replaces it. 1865 – Slavery abolished in the United Sates by the 13’th Amendment – About 150 years ago. 1874 – Mary Ellen Wilson – Hell’s Kitchen. The first court case for the protection of a child. The case was defended using, “Cruelty to Animals” laws. 1918 – Women’s right to vote – Granted by the 18’th amendment, by one single vote. 1947 – Jack Roosevelt Robinson – First African American drafted into Major League Baseball. 1956 – Althea Gibson – First African American to cross the color barrier in tennis. Althea Gibson won the Grand Slam title in 1956. 1965 – Voting Rights Act of 1965 – Right to vote for “All Americans” – provided federal oversight of elections in discriminatory jurisdictions, banned literacy tests and similar discriminatory devices, and created legal remedies for people affected by voting discrimination – mostly African American and other minorities. 1967 – Charles Luther Sifford – First African American to play on the PGA. 1970 – Carl Maxie Brashear – First African American to become a U.S. Navy Master Diver, despite having an amputated left leg. 1983 – Guion Bluford – First African American in space. Col. Bluford went on for a total of four shuttle flights into space. 2009 – Barrack Obama – First African American President, Mr. Obama served two terms. These people are some real African American Heroes. They did a lot more, and put a lot more on the line than than drop to one knee during the National Anthem at a football game. They put themselves on the line advancing the cause of all African Americans, breaking down numerous barriers in the process. All these events and the people in them took place in 144 years. Personally I think this is amazing progress, for the country. Some people alive today have real and implanted memories of family members who were slaves or Klan members in the1800’s. Many people alive today have either been or know someone who was a victim of a senseless racially motivated crime. One does not have to look very hard to find an example. What will happen in another 144 years, with barely two more generates come and gone? I hope as much as has happened in the last 150 plus years. Change doesn’t happen over night. If people want real change, they are going to have to work for it, not protest at a sports arena before a game.